I think this is worth following up on. We have been living here around 6 years now. The houses to either side of us are still unfinished, full of building defects. Unfinished after 6 years! They were built by another builder who did an astoundingly bad job, and then went out of business. As for us, we have had only minor issues, and very few of them. 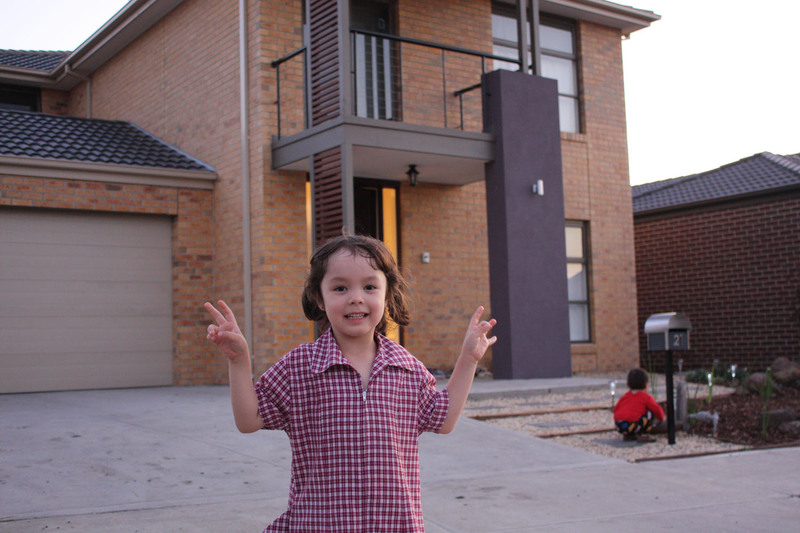 We are lucky to have built with Metricon. Just a few weeks ago, a piece of wood above one of our windows fell down. It looked like it had been stuck on with glue. It had stayed up for the past 6 years until now. It was from a second storey window so it was difficult to re-attach myself. I called Metricon, they sent someone out to inspect. He said it shouldn't have been stuck on with glue, and he will send someone to re-attach it, but I will have to paint it first. 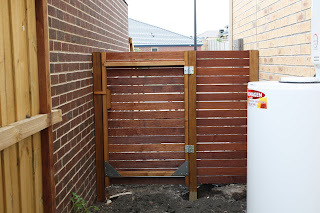 The tradie called me soon afterwards and said not only will he re-attach it, he will paint it for me too. He also agreed it's too heavy to be attached with glue, and put some screws in to hold it in place. I couldn't have asked for a better outcome. 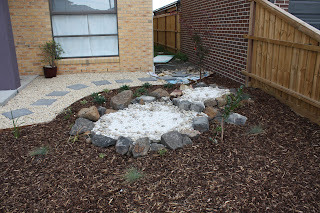 I have received another communication from Metricon's "Service" and Warranty department, where they said they will send someone out to take a look at the debris in our backyard, but warning me that if they are not satisfied that there is enough debris to remove, then they will "simply determine this matter closed". 1. Metricon claim that the debris was buried underground because it was wet, and a bobcat ran over it, pushing it into the ground. I said that if they let a bobcat run over the debris after it rained and pushed it into the ground, how does this make it my responsibility to clean it up? I think it makes it even more clear that they didn't clean the site according to the contract, and they need to finish the job. 2. That Metricon claims that they are not responsible for cleaning up small amounts of debris gives the impression that they are taking advantage of the work we have already done ourselves, in order to get out of the remaining work. I have told him previously that this issue is 5 months old, that the site supervisor in fact agreed to remove it, and have told him how much work we have done ourselves, but he does not seem to be interested in any of that. All he did was make a vague statement that their construction staff do not agree with something that I said, though he didn't specify what they disagree with or who disagreed with it. So, all I am waiting for now is for him to send someone out to assess the quantity of debris, and see if he deems it to be worth their time clearing. I think he has already decided, and I am fully expecting this to go to BACV and then to VCAT. But I will wait until he gives a definite "no", as I want to exhaust all possibilities before taking it to BACV. 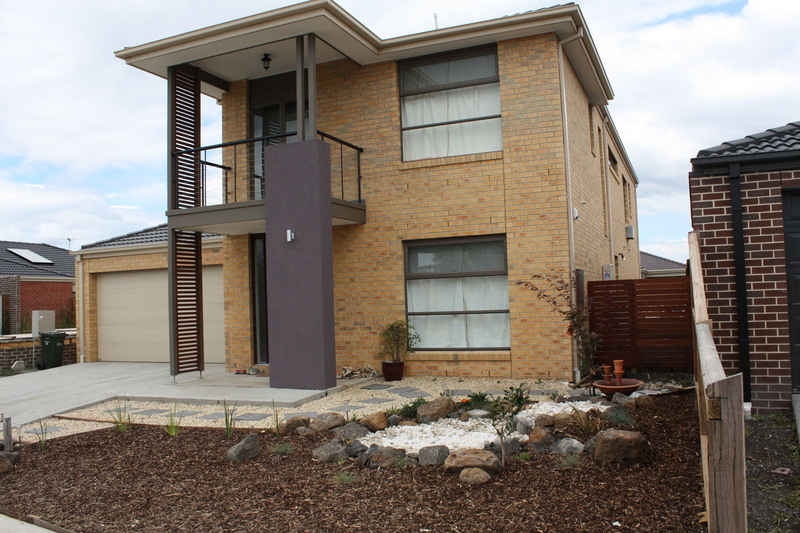 We have recently been dealing with North Warranties, the division of Metricon in charge of maintenance of new houses. So far our experience has been generally good. The initial person in charge of our house left with an unspecified illness, so we have someone new in charge. He has generally been good with handling our issues, though he did forget to deal with them for about 2 weeks until I gave him a call this week. After that it looks like things are back on schedule. At least our current guy is thorough, unlike previous ones who tended to forget anything that wasn't convenient. There is one issue however which has never been resolved, even after being in the house 7 months now. During construction Metricon somehow managed to leave large amounts of bricks, tiles and assorted construction debris UNDER the ground in our backyard. We have removed huge amounts of it ourselves, but every person I have asked at Metricon (and it's up to 5 now, with all the changes of site supervisors and warranty people and their supervisors) have tried to wiggle their way out of cleaning it up. I have to assume that it's not easy to do, which is why they drop eye contact whenever I mention it and look the other way. The only ones who have been interested in listening to me are the ones without any authority to do anything about it. So I'm now dealing with the supervisor of my current contact in the warranties department, seeing if he will finally be the one to admit that it's not ok to bury building debris in their customer's backyard instead of taking it off the site. The funniest thing here is that this supervisor told me that he doesn't think he needs to dig up the debris from underground because he couldn't see it in a photo. It reminds me of a case on a current affair the other day, when someone had a home loan taken out fraudulently in his name, and the bank said he couldn't have the loan taken off his credit record because he wasn't the real owner of the loan, and therefore he wasn't allowed to make any enquiries or requests regarding it. 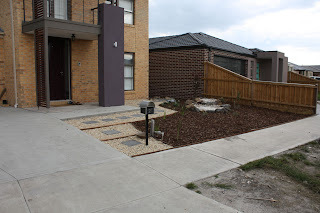 In other news, we have started landscaping on the dead side of our house, behind the side gate. First is drainage, then we will be putting the same pavers and gravel that we have at the front of the house. 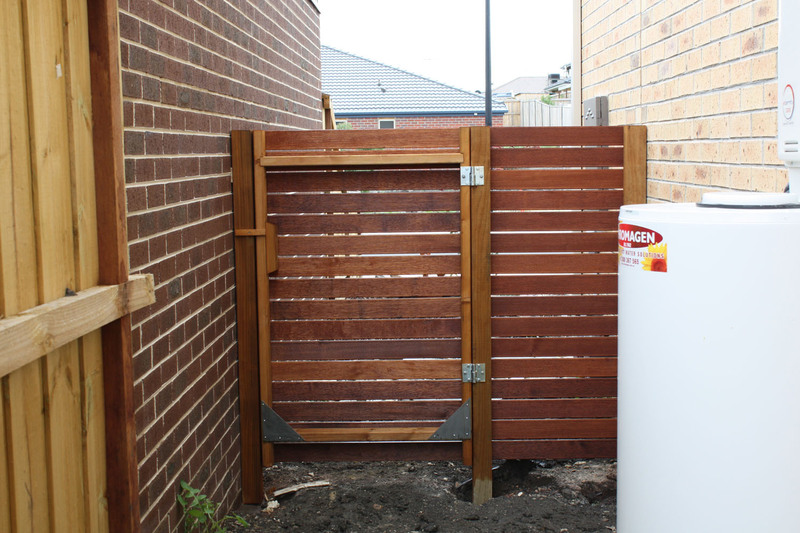 Pete and Bridget came over on the weekend and finished off the side gate! 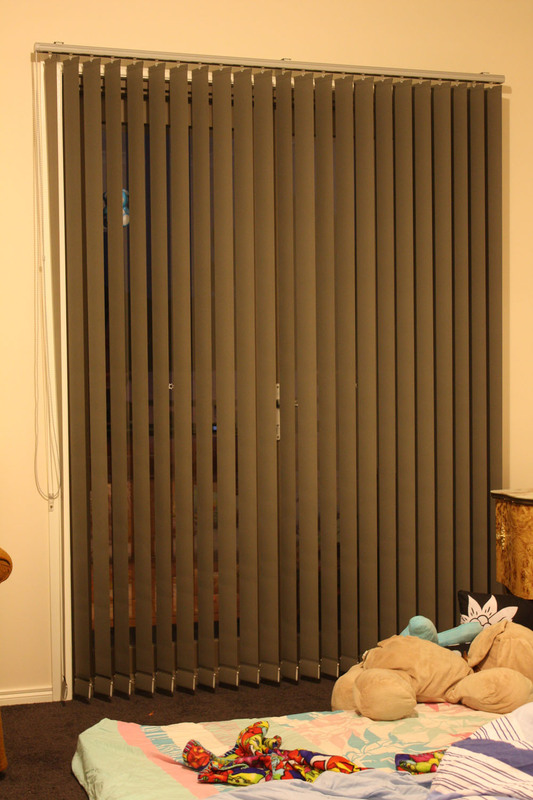 Pics are below, as well as some pictures of the blinds. Today the construction manager and our tiler came over to look at the ensuite shower base which wasn't draining properly. In the end the CM decided to take off all the tiles, screed the base again (ie change the levels so it drains toward the drain faster) and then tile it again. He said he was a bit concerned about water draining so slowly up on the second floor, presumably it increases the chances of it escaping into the walls or floor. Somehow we have managed to not kill this tree. New venetians in the computer room. Vertical blinds for the balcony door in the master bedroom. Our new site supervisor, in uniform. Her assistant is by the letterbox, taste testing the water for E Coli. We've had quite a busy week! First I got a call from our site supervisor, and then from his construction manager who came around on Tuesday to check on what needs fixing. And we had people coming around Tuesday and Wednesday fixing all the plaster and paint issues, installing external vents to the rangehood and powder room, and fixing broken tiles. They did a pretty good job - you can't even see where the old downlight holes in the ensuite were, or where the broken plaster was behind the rangehood. 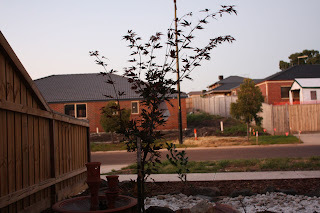 Pretty much everything has had a satisfactory outcome now except for two things - the construction manager said that the small diameter connected on the U bend in the laundry is suitable for connecting the laundry machine water waste on to, but the Bunnings plumber says it's too small. But if it's a matter of adding another connector at the right height we may be able to DIY. And the construction manager was not keen on clearing the buried building waste (bricks, tiles, etc) in the backyard. He was hinting that all he can do is send someone to clear what's visible on the surface, so I told him that most of the work is in actually digging the stuff up. We also had half our blinds installed on wednesday - lots of venetians for upstairs, as well as a panel glide for the back bi-part sliding door, and a vertical strip blind on the balcony door. 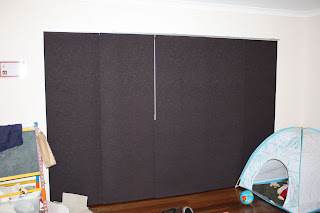 The installation (by Home Outlet) was good overall except the guy was a bit rushed, and he botched the sliding door blinds. Rather than removing the blinds from the holders and screwing them in properly he put the screws in angled upwards, and they went into the space behind the plaster instead of into the house frame, so the whole architrave was hanging precariously with a 10mm gap between it and the wall. I put some extra screws in at the right angle and it's now attached solidly. Can't complain about the price though. The kids have been playing hide and seek in the panel glides all evening, and Graham has been methodically opening and closing every venetian in the whole house. He'll make a good scientist or engineer. Pictures soon! 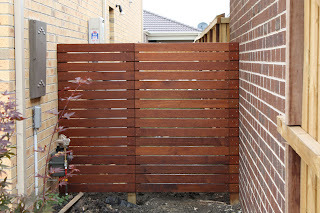 We also have half a fence at the side of the house installed by Pete, with the gate going in soon. The gate is around 35 kg so he's looking for some stronger hinges to make sure it's all solid. Our site supervisor has been found! Thankyou to all of you who helped search for him. He called me today and said that he has indeed got a new baby girl, and he is now back at work again. I also got a call from his construction manager, and various other people too. So it looks like things are back on track. 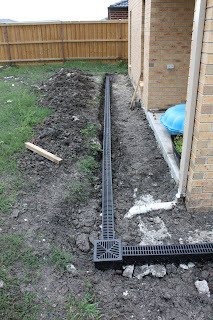 The other thing we have been working on is the drain at the back of the house. It is slowly taking shape. We're almost ready to begin on paving parts of it. More front landscaping. Since then we have some new plants under the window, and some more rocks. Drainage at the back. 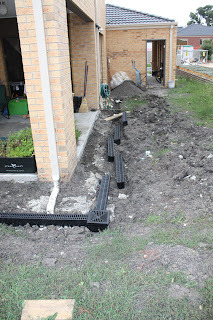 That pit in the corner has been connected all the way down to the stormwater pipes, which was rather tricky to do. Drain looking the other way. There's now a lot of crushed rock around these drains, getting ready for paving. On the left will go some treated pine sleepers to make a mini retaining wall. Metricon still haven't made our shelves for this unit, so I used some scraps from the WIR draw construction to make some myself. They are not quite deep enough so there is a bit of a gap at the back of each. 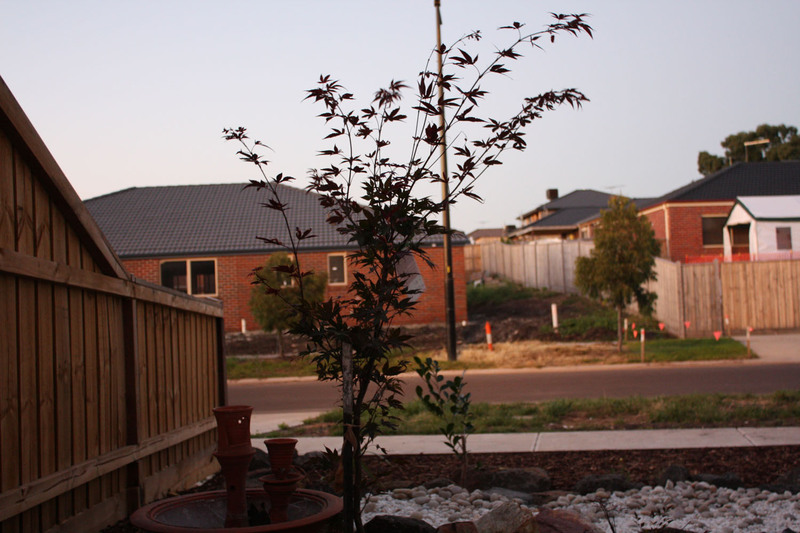 We have been watching a mystery unfold at Metricon over the past few weeks - where is our site supervisor? A few weeks ago he vanished, with his phone switched off and our CSC unable to find him. We have heard rumours and sightings, including that he is moving office, was seen at a training session and that his wife has just had a baby girl, but it seems even our CSC has trouble finding out where he is and when he will be back. So it was much to our surprise that this week we had no less than four visits to our house to fix things after handover! First was the splashback installers from Premium, coming to seal the splashback. 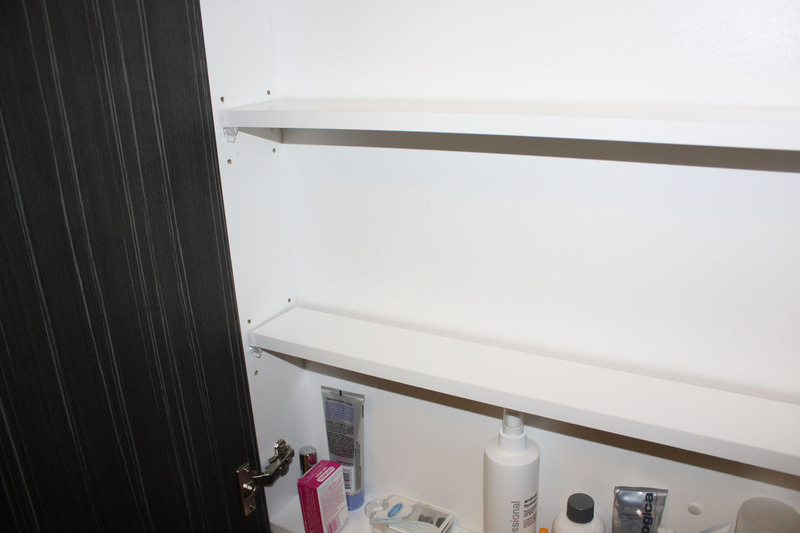 They did an excellent job on the left hand side, but the right hand side had been installed incorrectly - the issue was a power point near the corner, which made it impossible to have the splashback extend all the way to that corner. Someone at Premium decided that the solution was to make the splashback shorter, but neglected to consult us about it. Luckily the installer was very understanding, and suggested that if we can move the power point then they will be able to make the splashback as it should be. In the meantime he left that side unsealed, and took measurements and photos to help plan how to fix it. 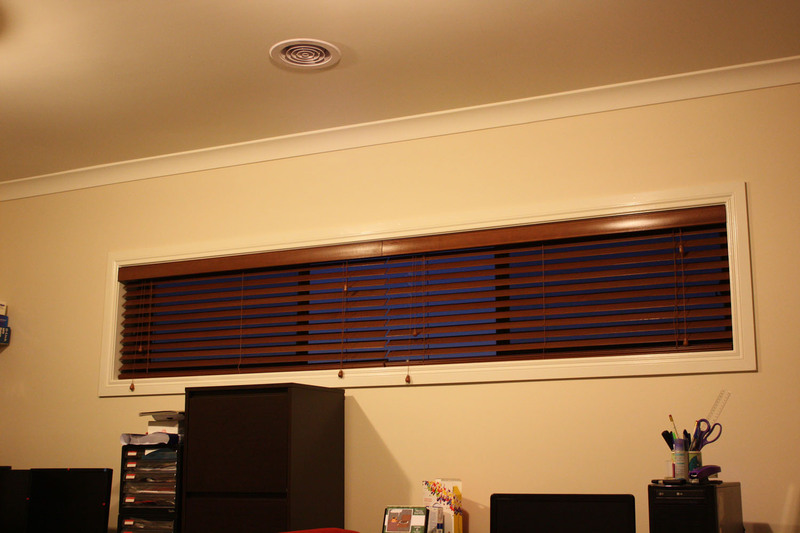 Next was another guy from Premium, who came to install the 500mm draw units in the minor bedroom WIRs. For some reason the original installer had put them in the master bedroom but forgotten to put them in the others. He commented that it was "unbelievable" that he was installing these so long after handover. 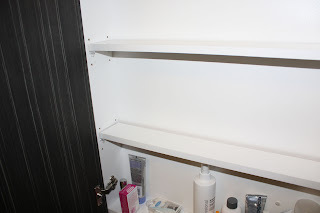 He left behind a pile of melamine shelf off-cuts, which I promptly snaffled to cut and use as temporary shelving for our ensuite above-counter cupboard, which the cabinet makers forgot to install. Then on wednesday we had the electricians come, fixing a number of issues. 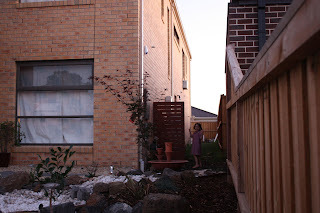 Some of them were minor, such as downlights that were not functioning at handover and others that had broken within a few weeks of handover, and installing the missing floodlights outside. They also moved the power point in the broom cupboard to above the shelf, helpfully leaving a single power point at the bottom so we could still connect our router and modem (they weren't able to move the data points - those are still at floor level). And they moved the downlights in our ensuite to much more sensible locations, above the sinks instead of above our heads when we stand in front of the sinks. Other things were installing the light on the pier at the front and installing the junction box for the rainwater tank. The final visit was also on wednesday, and it was Crimesafe coming to wire up our intercom. 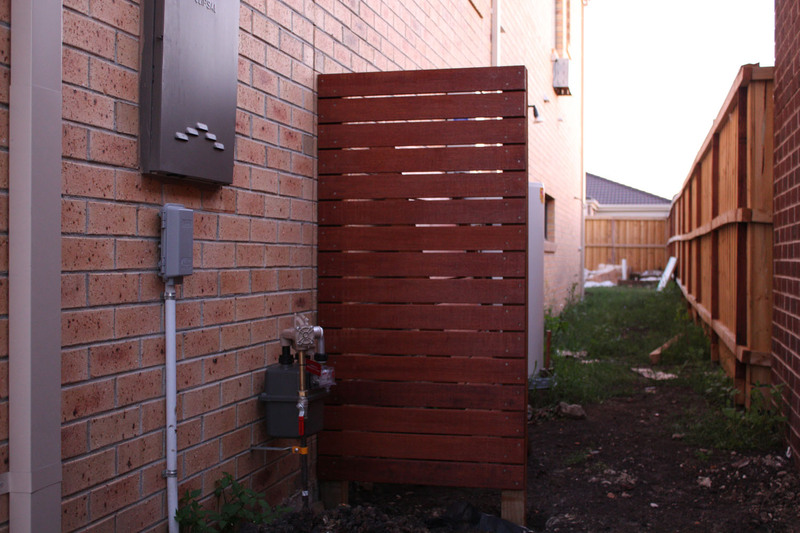 The intercom had been fully installed previously, but it was stolen just before handover, and although it had been replaced, no-one knew how to wire it up. So this visit was just to connect those wires. Gisele is duly impressed with the intercom (which has audio and video of the portico outside the front door), and uses it whenever she gets the chance.